Posted on 2014/06/09, 14:20, by dachas, under レポート. Posted on 2014/05/18, 21:15, by dachas, under お知らせ. Posted on 2013/03/16, 13:50, by dachas, under レポート. 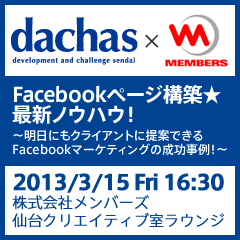 Posted on 2013/02/25, 16:00, by dachas, under お知らせ. Posted on 2012/11/29, 15:00, by dachas, under お知らせ.